So here we go again! 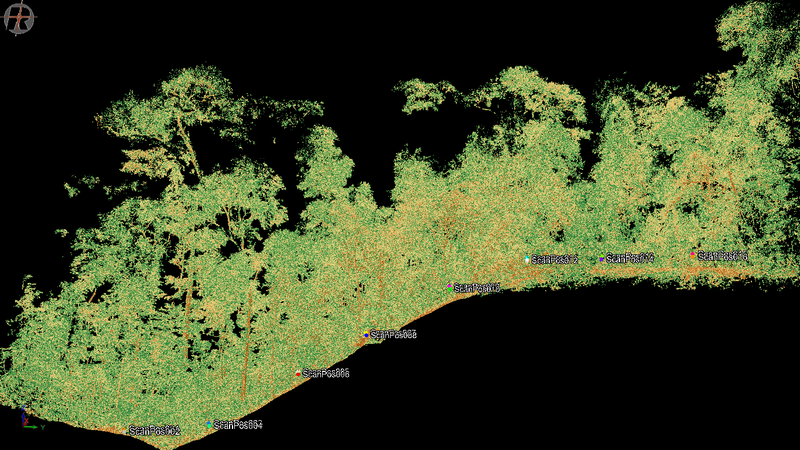 This time we're scanning in Ghana, as part of the European Space Agency-funded AfriSCAT project, using our lidar to characterise the 3D structure of a piece of the Ankasa Forest reserve. 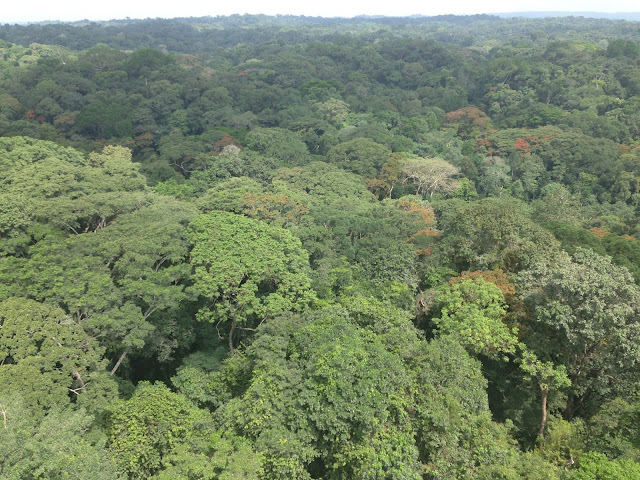 AfriSCAT is designed to provide RADAR measurements of tropical forest, in preparation for the launch of the ESA BIOMASS Earth Explorer satellite mission in 2020. BIOMASS is a P-band (70cm) RADAR mission, which will allow it to 'see' through dense canopies to the larger trunks and branches; shorter wavelength RADAR (and optical signals) can't see through the upper part of dense tropical forests. So the ESA team want to know what their RADAR is seeing, and that's where we come in! 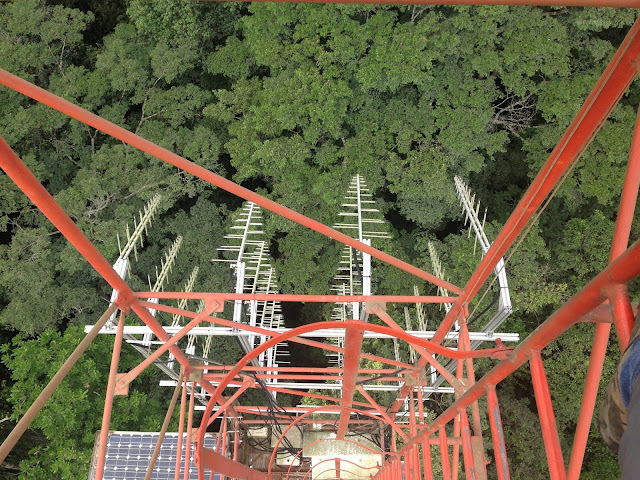 The AfriSCAT P-band RADAR instrument on the tower in the Ankasa forest. We visited the site, with the help of collaborators from CMCC in Italy, along with our colleagues from Wageningen University, Alvaro Lau Sarmiento, Cornelis Valk, Harm Bartholomeus and Martin Herold. so we could operate two lidars of the same type, in order to move faster and reduce risk. 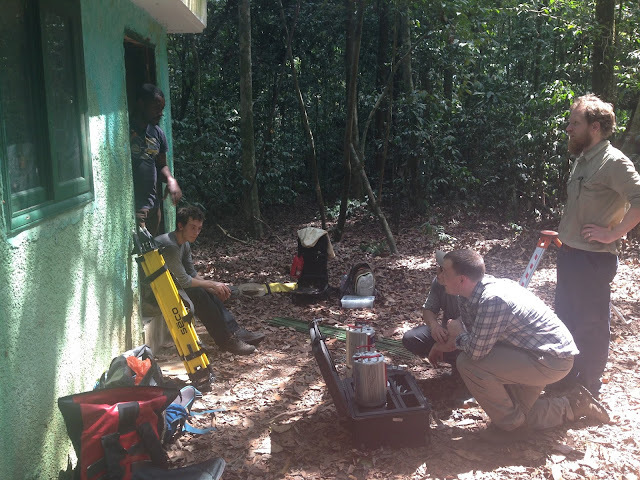 This is the first time we think anyone's deployed two lidars simultaneously in a tropical forest like this. It involved a bit of planning and synchronising so we all use the same protocols, but it seems to be paying off in terms of what we can cover. Also visiting was Yadvinder Malhi, our colleague from Oxford, who's been working at the Ankasa site for some time (and in Ghana more generally), establishing several large permanent plots in overlapping the one we were scanning and nearby. Yadvinder is working with with Harm and Juha Suomalainen, also from Wageningen, to collect UAV data over the site. Yadvinder is particularly interested in the relationship between tree traits, and structure, and is using the hyperspectral UAV data combined with detailed measurements made by his ground team, to try and understand these issues. See some lovely examples of the UAV footage of the site on Yadvinder's blog. L to R; Justice, Cornelis, Alvaro, Andy and Phil (standing). The view from the Ankasa tower is pretty stunning, if a little hot in climbing. The team, sitting on a buttressed root with the two lidars. 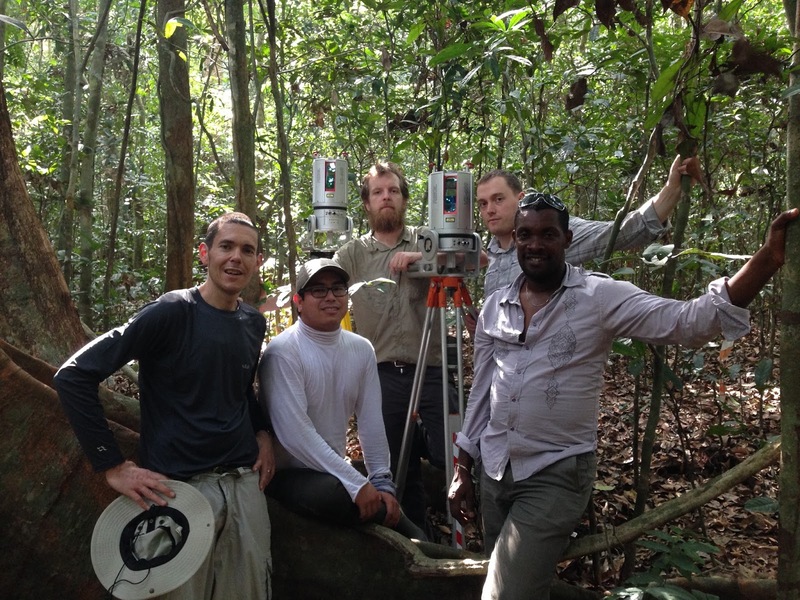 So far, data collection has been looking good, despite some pretty challenging terrain. The image below shows a slice through the plot, which illustrates the nature of the terrain in the plot. Scanning on slopes like this is hard. The weather has held up - no rain and not too much wind so far - and other than a bit of sunburn, so far nothing too tricky in the way of hazards. We didn't see a single mosquito in a week. Result! An example of a slice through the AfriSCAT footprint plot showing the scan locations on the slope. The colours are reflectance i.e. 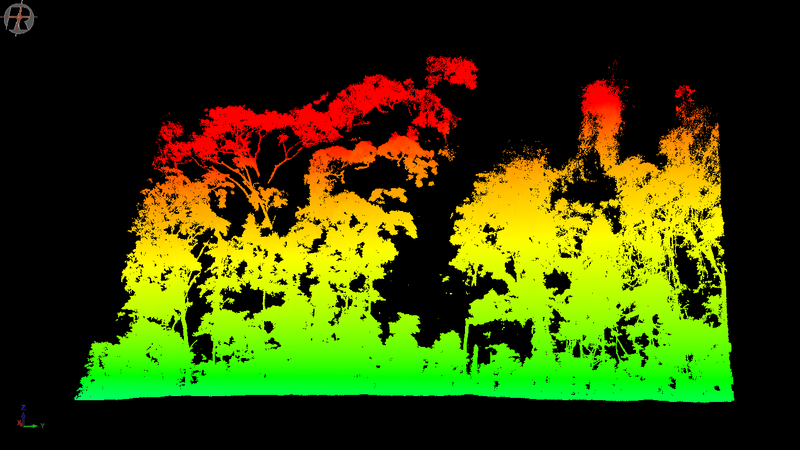 brighter colours represent higher scattered lidar energy. Below we can see another example of the lidar data from the AfriSCAT plot, from two scan lines, and joined together by Andy. A slice around 70m long and 5m deep through the plot, coloured by height up to around 40m for the tallest trees. Our research here has been funded primarily by ESA as part of the BIOMASS mission, but also in part by NERC through our involvement with NCEO and a recent Standard Grant award for tropical forest measurements.